First edition. A Middle High German epic, a retelling and continuation of Wolfram’s Parzival story. Der Jüngere Titurel is a retelling of the Parzival story, a tale of courtly love - that of the knight Schionatulander for Sigune. It tells the story of the Holy Grail, the chalice from the Last Supper, in which Joseph of Arimathia collected the blood from Christ's side wound. The text is written in strophic verse and already anticipates in the preface - with the words 'virtue', 'doubt', 'baptism', 'joy' and 'art' - the crucial motives of this composition. The story evolves dramatically and describes, among other subjects, dangerous journeys in the Middle East and chivalric festivities. Until the modern era, Der Jüngere Titurel was considered the work of Wolfram von Eschenbach, one of the greatest epic poets of the Middle Ages whose own Titurel remained fragmentary. The author of the present work, Albrecht, reveals himself once towards the end of the epic and acknowledges Wolfram as his master. His book continues the story of Wolfram's Parzival and incorporates and further develops Wolfram's Titurel fragments. 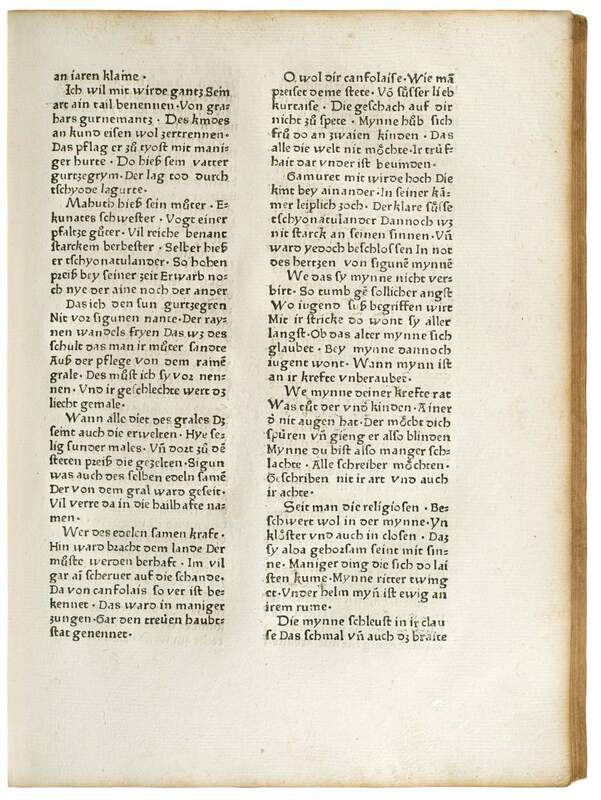 As the layout of the edition at hand leaves numerous column-width spaces of ten- to sixteen lines blank the copies were likely meant to be illuminated. No copies with supplied miniatures are known, however.